Handbook of Fire and Explosion Protection Engineering Principles for the Oil, Gas, Chemical, and Related Facilities Nolan Dennis P.
Auteur : Nolan Dennis P.
There are extensive resources full of fire and safety codes and standards, but they are not written specifically to oil and gas or other related process engineering industries, and most engineers must search in multiple locations to locate all the relevant pieces, costing time and money. 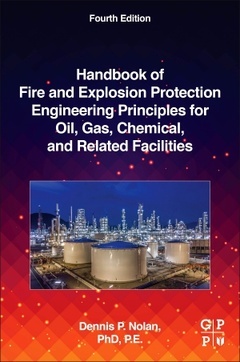 Handbook of Fire and Explosion Protection Engineering Principles for the Oil, Gas, Chemical, and Related Facilities, Fourth Edition starts off with high-level risk analysis and progresses to cover advanced technical considerations such as process control, emergency shut-downs, and evaluation procedures. More engineers and managers are adopting risk-based approaches to minimize risk, maximize profits and keep operations running smoothly, and this reference encompasses all the critical equipment and standards necessary for the process industries, including oil and gas. Updated with new information covering fire and explosion resistant systems, drainage systems, and human factors, Handbook of Fire and Explosion Protection Engineering Principles for the Oil, Gas, Chemical, and Related Facilities, Fourth Edition continues to deliver all the collective design and equipment standards needed to protect today?s petrochemical assets and facilities. Dr. Dennis P. Nolan has had a long career devoted to risk engineering, fire protection engineering, loss prevention engineering and systems safety engineering. He holds a Doctor of Philosophy degree in Business Administration from Berne University, Master of Science degree in Systems Management from Florida Institute of Technology and a Bachelor of Science Degree in Fire Protection Engineering from the University of Maryland. He is a U.S. registered professional engineer in fire protection engineering in the state of California.He is currently on the Executive Management staff of Saudi Aramco, located in Dhahran, Saudi Arabia, as a Loss Prevention Consultant/Chief Fire Prevention Engineer. He covers some of the largest oil and gas facilities in the world. As part of his career, he has examined oil production, refining, and marketing facilities under severe conditions and in various unique worldwide locations, including Africa, Asia, Europe, the Middle East, Russia, and North and South America. His activity in the aerospace field has included engineering support for the NASA Space Shuttle launch facilities at Kennedy Space Center (and for those undertaken at Vandenburg Air Force Base, California) and “classified national defense systems. Dr. Nolan has received numerous safety awards and is a member of the American Society of Safety Engineers, He is the author of many technical papers and professional articles in various international fire safety publications. He has written at least four books, several published by Elsevier.